a sheetlike tendinous expansion, mainly serving to connect a muscle with the parts it moves. adj., adj aponeurot´ic. 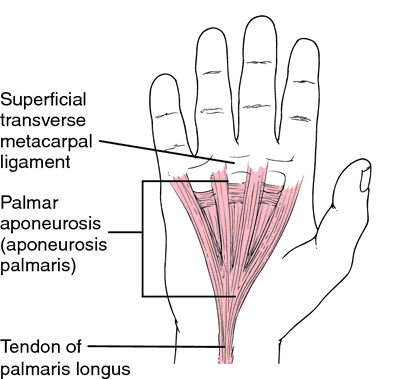 Palmar aponeurosis. A fifth longitudinal band, radiating toward the base of the thumb, is sometimes present. From Dorland's, 2000. A fibrous sheet or flat, expanded tendon, giving attachment to muscular fibers and serving as the means of proximal or distal attachment (origin or insertion) of a flat muscle; it sometimes also performs the functions of a fascia for other muscles. Palmar aponeurosis. A fifth longitudinal band, radiating toward the base of the thumb, is sometimes present. extensor aponeurosis see under expansion. 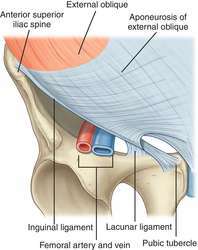 a strong flat sheet of fibrous connective tissue that serves as a tendon to attach muscles to bone or as fascia to bind muscles together or to other tissues at their origin or insertion. aponeurotic, adj. Anatomy A flat sheet of fibrotendinous tissue which forms the site of attachment of flat muscles or corresponds to a zone of separation of flat muscles. See Bicipital aponeurosis, Plantar aponeurosis. A fibrous sheet or flat, expanded tendon, giving attachment to muscular fibers and serving as the means of origin or insertion of a flat muscle; it sometimes also performs the functions of a fascia for other muscles. A thin flat sheet of tendinous tissue which covers a muscle or by which broad, flat muscles are connected to bone. ribbon or sheet of collagenous connective tissue, either as a separate structure (e.g. plantar aponeurosis in the sole of the foot) or providing a wide area of attachment for one or both ends of flat muscles (e.g. sartorius). pl. aponeuroses [Gr.] a broad, sheetlike tendon. the broad tendinous portion of the oblique and transverse abdominal muscles that attaches to the linea alba. a fascial sheet within the pharyngeal wall, lined with mucous membrane and covered by the pharyngeal constrictors. El musculo gracilis, ancho y plano, cubrio la parte media caudal del muslo y se origino en la sinfisis pelvica por medio de una aponeurosis comun con el del lado opuesto, insertandose en el borde craneal de la tibia, donde se adhirio a la fascia cruris. Desde sus origenes proximaies, ias cabezas corta y iarga dei muscuio biceps brachii permanecian separadas en su recorrido; a 2,5 cm por encima de ia articuiacion dei codo ias dos cabezas se fusionaban y formaban un tendon comun ei cuai se unia a ia parte posterior de ia tuberosidad dei radio; se pudo evidenciar ia insercion distai en ia fascia antebraquiai a traves de ia aponeurosis bicipitaiis. To quantify strain, the intersection point between a selected fascicle and the deep aponeurosis was digitized in each US video sequence and its displacement was measured. We showed that thickened aponeurosis and nodules had a firm structure with a predominant red color compared to the surrounding tissue in sonoelastographic findings of DC. We numbered aponeurosis of origin by arabic numerals and insertions by roman numerals (Hofling and Gasc, 1984). Ultrasound has been used to measure foot muscles  and skin and plantar aponeurosis . 10,11) Other sports hernia descriptions have included abnormalities of the rectus abdominis muscle, avulsion of part of the internal oblique muscle fibers from the pubic tubercle, tearing within the internal oblique muscle, or abnormality within the external oblique muscle and aponeurosis. Using RF to punch on muscle tendon aponeurosis, can support cell viability, kick sta- rt cell proliferation, stimulate healing response and improve tendon revascularization, which are beneficial to recovery. 28) In the final 10% of stance, first MPJ dorsiflexion increases the tensile force of the plantar aponeurosis in conjunction with contraction of the gastrocnemius and soleus, creating the windlass effect, which assists with propulsion. The impingements are often at the spinal roots adjacent to the bodies of the vertebrae, but they can also occur along the nerve pathway or on the outer layer of the thoracolumbar aponeurosis.